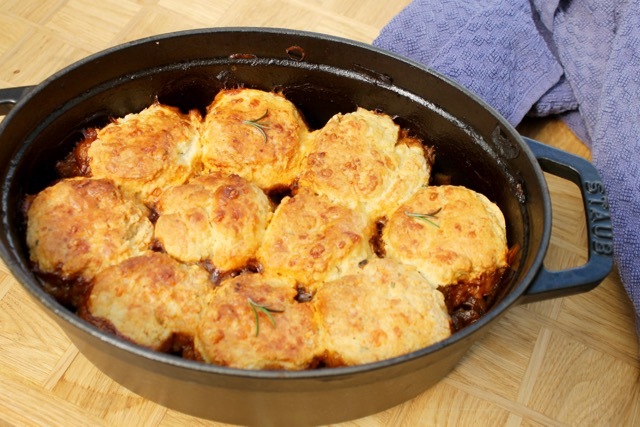 I used to love the Beef Cobbler my mum made when we were younger, it was the ultimate in comfort food and its one of my earliest food memories. When Simply Beef & Lamb asked me to join in their live peasant challenge to make an easy one pot dish I knew I would try to create my own take on it. My mum used to use beef mince but I have instead used beef pieces instead. Whilst this may not be the most traditional version it worked out perfectly and we all loved it. Adding fresh rosemary to the scones gave them a wonderfully herby flavour. When buying beef or lamb look out for a quality mark like the Red Tractor logo which guarantees the meat you are buying is farm assured. 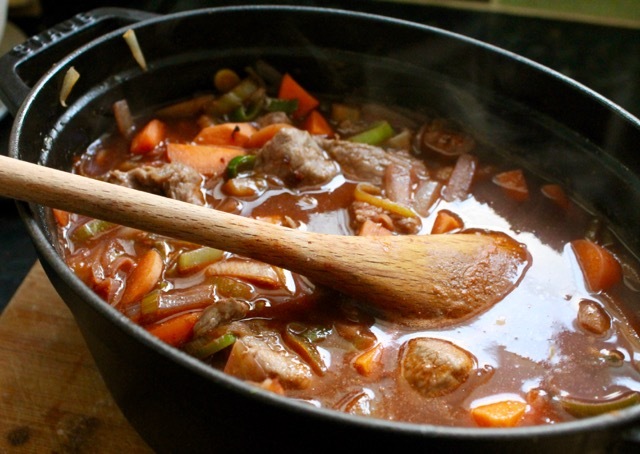 Using casserole beef pieces in a slow cooked dish means you get gorgeously tender meat at an affordable price. This is also the kind of dish you could make early in the morning ready to eat to eat in the evening or even the next day – the flavour only improves with time. Red Tractor Beef & Lamb has launched a campaign to celebrate the peasant food trend, and inspire families to rediscover traditional cooking techniques, from around the world that are simple, warming and hearty. With the launch of the #LivePeasant challenge, we want families to reclaim traditional cooking and let the oven or slow cooker do all the work. Using inexpensive cuts of beef and lamb, which are perfect for slow-cooking, dishes can be prepared in advance and left to cook so that delicious, melt-in-the-mouth home-cooked meals are ready and waiting when you are. So take a little time to discover the peasant food trend and enjoy the benefits of a meal with less haste more taste! Preheat your oven to 180c. Prepare your vegetables. 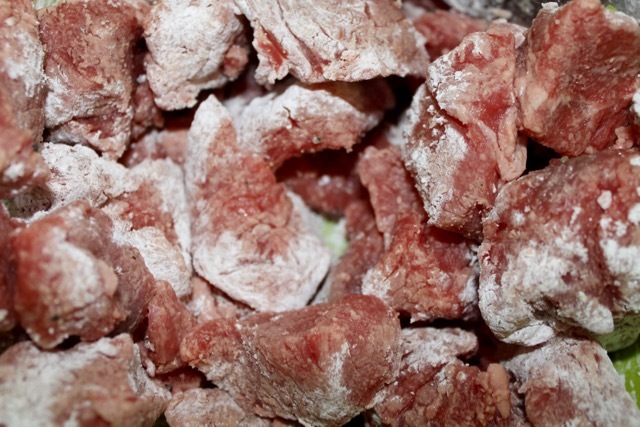 Mix your flour, salt and pepper in a bowl, toss your beef in the mixture. Now add 2tbsp of your oil in a casserole dish ( which is suitable for both hob and oven cooking ) then brown your meat on all sides. Remove and set aside. 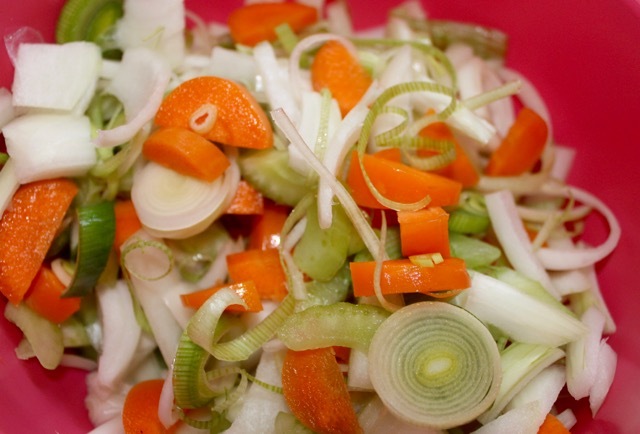 Now add your remaining oil and sauté your vegetables until softened – add your tomato puree. Pour in your wine and stock, stir well. Add your bay leaf and place a lid on top and oven cook for 1.5 hours. In the meantime make the scone mixture. 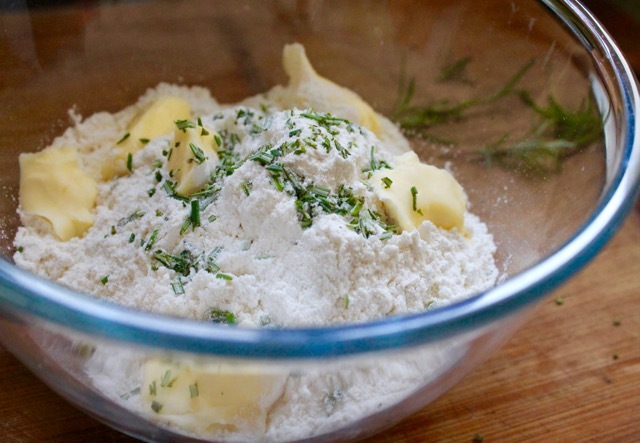 Mix your flour with the salt, pepper and rosemary then rub in your butter, add your egg(reserve a small amount to glaze), cheese and milk and mix to a dough. Place your dough on a floured surface and flatten into a circle. Using a small round cutter, cut out 8 rounds. Remove your dish from the oven and place your scone rounds on top,glaze with egg and return to the oven without the lid. Bake for a further 15-20 minutes until the scones are golden brown. Add a few sprigs of rosemary to garnish. Tip: take it up a notch by brushing the scones lightly with melted butter when you remove from oven – adds an indulgent taste. Serve alone or with fresh bread or a mound of mash and some greens. What are your favourite one pot dishes? * This recipe was created as part of a campaign with simply beef and lamb – I was compensated for my time and the ingredients. Do you know, I’ve actually never had a cobbler? We used to eat shepherds or cottage pie all the time growing up, but not the same. Lovely some crispy toppings, and great to support good quality beef! What a lovely looking dish of deliciousness….. loving the idea of rosemary in the topping too. This is the kind of cooking I miss since my husband turned vegetarian a few years ago! I’ll have to wait for some meat eaters to come over for dinner as an excuse to make it! This has comfort food written all over it. My mom used to make something similar when I was growing up. I love the addition of rosemary! Delish! 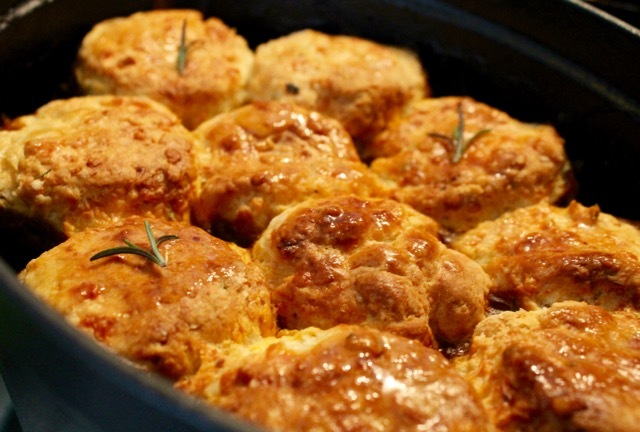 I could eat those rosemary and cheese scones on their own, they look so good! Ooh, like Ceri I’ve never had a cobbler either but the combo sounds divine. Love that crumbly scone texture and I can imagine the rosemary-infused goodness going amazingly with the beef casserole base. Yum! This sounds so interesting and is making my tummy rumble!! Saving and sharing! Ummm, this cobbler is making me hungry even though I just ate dinner!! !